As you leave Claremore heading to Catoosa and Tulsa along the Route 66, you will soon pass over what was once the site of two huge steel truss bridges that cross the Verdigris River. Both bridges, once dubbed “Felix” and “Oscar” by locals, served original Route 66 travelers but were built more than 20 years apart. The first bridge, which later became the westbound bridge, was built in 1936, but as travel increased, an additional overpass was constructed in 1957, which now serves eastbound traffic. This pair of mismatched bridges became a photo op for Route 66 travelers for many years. But, in August, 2011 the State of Oklahoma was forced to remove and replace the 1936 bridge due to its state of disrepair. 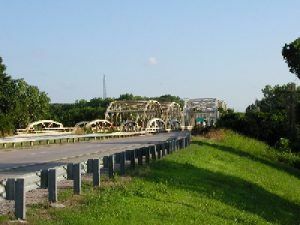 This controversial move resulted in the Oklahoma Department of Transportation entering into an agreement with the state’s Historical Society to produce a documentary about the 1936 “Bird Creek Bridge,” repaint the 1957 bridge by 2015, and formulate a still-pending maintenance plan for Oklahoma’s surviving Route 66 bridges. Large pieces of the 1936 bridge now can be found guiding the entrance to the nearby Molly’s Landing restaurant, just west of the old bridge site. Other large pieces of the bridge also can be found at Rogers Point Park, on the east side of the river near the bridge site. 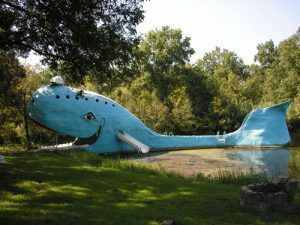 Just beyond the bridges you will come to the site of Catoosa’s famous Blue Whale; an absolute must stop for Route 66 travelers. 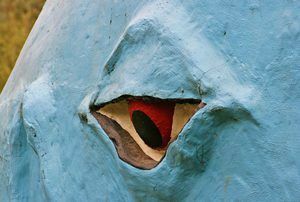 One of the most recognizable icons on Route 66, the attraction was built by Hugh Davis in the early 1970s as an anniversary gift to his wife Zelta, who collected whale figurines. Hugh and Zelta had over 40 years of zoological experience when Hugh built the 80 foot long grinning Blue Whale. Hugh, who had retired by that time, owned the land on which the attraction was built and surprised Zelta with the massive project for which she had no idea. Originally, the pond surrounding the massive Blue Whale was spring fed and intended only for family use. However, as many locals began to sneak in to enjoy its cool waters, Davis brought in tons of sand, built picnic tables, hired life guards, and opened his masterpiece to the public. 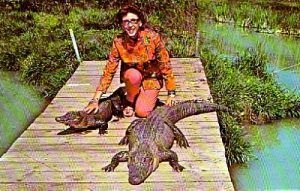 Originally called Nature’s Acres, Hugh continued to build the attraction until it eventually included The Fun and Swim Blue Whale and the A.R.K. (Animal Reptile Kingdom). The attraction also featured Hugh’s brother-in-law, Indian Chief Wolf Robe Hunt, a full blooded Acoma Indian, who was famous, in his own right, for his Indian paintings and as a highly skilled silversmith. Chief Wolf-Robe Hunt once ran the Arrowood Trading post across the highway from the Blue Whale attraction. In no time at all, its pond, giant Blue Whale, and zoo, housed in a wooden ark, attracted both locals and travelers alike. Children flocked to slide down the tail of the large Blue Whale into the cool waters of the pond, as families enjoyed the picnic tables, concessions, and boats provided at Nature’s Acres. In 1988, the aging couple found that they could no longer handle the management of the attraction and it was closed. Just two years later, Mr. Davis died. The park soon fell into disrepair, crumbling from neglect and weather. 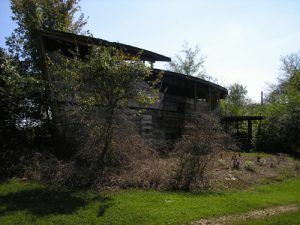 However, in the early 2000s, Blaine Davis, a son of Hugh and Zelta Davis, became a part-time caretaker of his parents’ property, and it reopened. A few years later, a large group of volunteers from the Hampton Inn hotel chain pitched in to help clean the grounds. A local volunteer group, Fins of the Blue Whale, formed in 2009 and began long-term efforts to improve the grounds — including plans to eventually renovate and reopen The A.R.K. as a museum. In the summer of 2011, the Blue Whale was given a fresh coat of paint thanks to the donation of time and effort by Bill Haynes company of Tulsa. Another interesting thing about Catoosa is that it is a seaport town! An inland seaport? Yes! In fact it is the furthest inland seaport in the United States, linked to the Arkansas River system all the way to Gulf of Mexico. Located at the head of navigation for the McClellan-Kerr Arkansas River Navigation System, the Port of offers year round, ice-free barge service with river flow levels controlled by the U.S. Army Corps of Engineers. Located in a 2,000 acre industrial park and employing more than 2,500 people, the port ships manufactured goods and agricultural products from America’s heartland to the rest of the globe.